John Curtis, Robin Wynne-Edwards, and Hub Steenbakkers braving the thin 4" ice for their sport! From all the staff at KYC we would like to wish you a joyful holiday season and happy new years! Please be reminded that we will be open for the New Years Leeve and will re-open January 17th. This week is the time any last minute shopping! We have some terrific jackets, long sleve sweaters, toques, ball caps and nifty collared shirts for all your loved ones! Stop in and "let's make a deal!" Please note that the kitchen will be open for full service December 22. The kitchen will be serving lunch on December 23rd, but will be closing before dinner service. We will re-open January 17th, 2017. Happy Holidays! 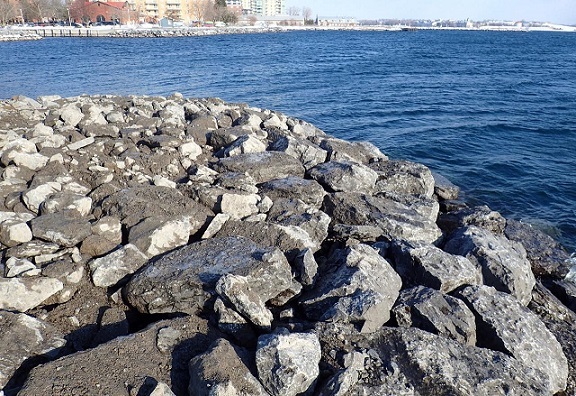 We’re pleased to report that this fall’s breakwater work is mostly complete. Along with the break wall reinforcement, we now have rebuilt the easternmost end of the breakwater. Rubble had been washed into the lake over the past many years, leaving an underwater “ledge”. We have filled out approximately 14’ to the edge of the ledge and “around a bit”. It took 8 truckloads, amounting to more than 154 tonnes of rock. This will give some extra wave breaking for our eastern tenants. It may look like just a rock pile - And it is. But it will make a noticeable difference. With more pieces coming into place, we hope to do more work: dock repair and expansion, extra docks (the W), T-dock repair/alterations, relocation of the existing L attenuator, and the building of a new T attenuator. Stay tuned. Big thanks go to the work of the harbour redevelopment committee, chaired by the very able Chris Walmsley. I’d like to single out Rob Crothers, Gord Crothers, Brad Strawbridge, Jim Beatson, Ross Cameron (and I) and the crew from Morven Construction. A lot of work done in a timely and efficient fashion.